The cabin often conjures up images of a rustic vacation home tucked away in the woods where one enjoys recreation such as hunting or fishing. However, a cabin style home can also be great as an everyday house. City and suburban residents are adopting the rich character of cabins for their own homes, and their popularity is growing. Though the most well-known form of a cabin is the log cabin, many cabins are often made of simple clapboard, and are designed with simplicity in mind, whether on the water, in the woods, or tucked against the mountains. Because the straightforward four corner footprint and simple roof of a cabin make it inexpensive to build, they can be quite affordable, depending on the location. If used as a second home, homeowners can utilize it for rental income when located in vacation locations. Though many cabins are designed as true getaway homes with pared down space and amenities suitable for weekend stays, others offer all the comforts of home, with enough bedrooms and bathrooms for every family member and guest to enjoy some privacy. When it comes to renovations, because of a cabin’s simple footprint on typically a larger plot of land, going out or up can be quite easy for added space. Architectural touches are the first step in creating a home with a cabin feel. Exposed wood, whether on the walls, ceiling, or beams, creates a rich and cozy feel. Simplicity is key – less is more, and by not over decorating your space you will feel more relaxed. 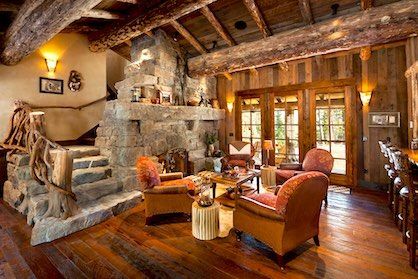 Natural elements are necessary for a cabin feel – stone, wood, leather, and granite are only a few examples of how a cabin can feel like a luxury home. The history of the cabin is as rich as the wood used to build them. Found in history as early as the 17th century, cabins were originally built of logs by Eastern and Central Europeans. This tradition continued with U.S. settlers in the 18th and 19th centuries, from the south all the way to the west coast. Today, the style has morphed into the Craftsman style, a rustic, traditional style of home that also has great character and luxurious touches. From mountain ski chalets to suburban cottages, the cabin is an enduring style that personifies America. A cabin is an ideal style home for those looking to live a simple life while embracing the great outdoors.